If you're looking to introduce something sumptuous to your home then take a look at the Taurus Dining Chair Brown, a luxurious item with an inviting appearance. Modern and multipurpose, the Taurus will make a stylish statement wherever it is used. 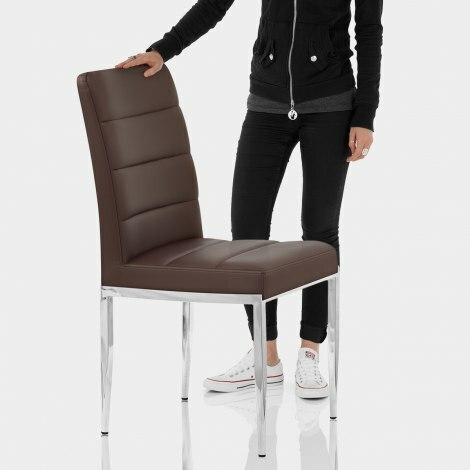 This chair is composed of a faux-leather seat and a tall ergonomic backrest, both of which are padded comfortably. 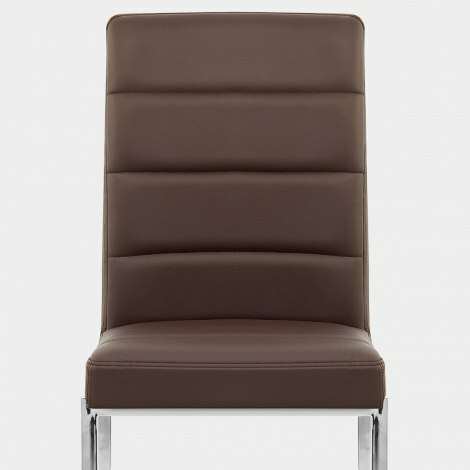 The brown faux-leather seat catches the eye due to its delicious depth of colour and segmented lining. The svelte but sturdy chrome frame is a solid base. Doing everything a good dining chair should and more, the Taurus even includes protective rubber plugs on the rim of each leg, helping to define it as a stool worth wanting. "Excellent dining chairs at a very reasonable price"
Excellent service.Quality chairs and they arrived on time. Lovely comfy chairs and reasonable quality at the price. No complaints. Arrived very promptly, easy to assemble and look fabulous. New kitchen and didn't want to lose an oak table so modernised with these chairs and we're really pleased with the result. Would recommend. We have been looking for chairs that would sit right in our new kitchen at our beautiful new oak table and we are not disappointed. The chairs arrived very well packaged and protected. Recommended to us, by my brother and sister in law, who have these in the grey, the chairs are of outstanding quality and value for money. Very happy satisfied customers.